The aim of :/technogogy is to promote and expand the educational potential of new technologies through sound pedagogical exploitation. Here you can find materials and advice on the use of ICT, new technologies and social media in education. :/Training & consultancy services - I can offer a range of training and consultancy services as well as project management and assistance with electronic content development. :/Partnering and sponsorship - At present I'm looking for potential partners and sponsors to help me develop the work I've been doing over the last 4 years. 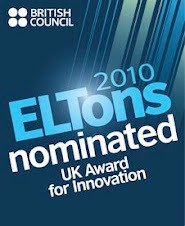 My Daily English Activities blog was among the products that were shortlisted by the British Council for the 2010 Innovation awards. :/Daily English Activities - has a collection of more than 100 online activities that EFL or ESL students can do each day to improve their English and develop their digital literacy. Students can work on these autonomously or teachers can set them as homework tasks. :/On Learning Technology - is aimed at teachers and teacher trainers and has a range of articles that show how specific learning technologies can be used within the ELT teaching context. It combines technical 'How to' information with suggestions for pedagogical exploitation. :/Quick Shout - combines news on new web based resources and educational developments with quick tips and suggestion on how teachers can exploit these to help their students learn languages. :/On Blogging & Social Media - was designed to help educationalists, particularly those interested in developing an online presence and building networks for professional development. It features articles on blogging and social networking tools and some tutorials on some of the technical aspects of website development and tracking. :/Technogogy news portal - is where you can find links to interesting articles, videos and conferences related to educational technology and ELT. :/Conference & workshop presentations - Here you can find out what I've done and some of the things I will be doing in the near future.